Hi friends we have reduced our pricing by 20% So hurry up & place your order. Copying of Food Delivery System By Model Train in Any running or fore-coming restaurants which was introduced by Decibel Scale Models First in Guwahatti will be taken as infringement of Patent and will be punishable Soon under Patent Act 1970 & Amended Act 2005. Whats The Right Size For Me.....? whopping 203/4" long in large scale. The largest scales in use today are collectively called “large-scale trains.” These models are offered in a range of scales, and all operate on Gauge 1 track. This track has 45mm between the rails. To give you an idea of the size of these trains, the 50-foot-long locomotive shown in the photo above measures about 203⁄4 inches in 1:29 scale. The most popular gauge for toy trains is O, with 11⁄4 inches between the rails and built to a ratio of 1:48. The 50-foot locomotivein the photo is 121⁄2inches long in O. Slightly smaller than O gauge trains are S gauge trains. They run on track whose rails are spaced 7⁄8 inches apart, and have aratio of 1:64. Scale models built to be approximately half the size of O gauge models are called HO.These trains have a relationship of 1:87 to their full-size compatriots, and the track gauge measures 16.5 mm. Our 50-foot locomotive now measures only 7 inches in length. HO trains are small enough to allow you to plan a satisfying layout in a compact space, and still are large enough to show off lots of detail and be easy to work with. HO railroading is the most popular of the scales, with more than two-thirds of modelers making it their top choice. Smaller still is N scale. Rolling stock and locomotives of this size are designed to be in a ratio of 1:160 to their prototypes. The track gauge is 9 mm between the rails. N scale works well for modelers who don’t have a lot of space at their disposal or who prefer to run their trains through truly expansive scenery.Even smaller are Z scale trains. Their proportion to the prototype is 1:220, and they run on track whose rails are 6.5 mm apart.How tiny is this scale? That 50-foot locomotivemeasures just 23⁄4 inches in Z. No one scale is right for everyone. Look at several scales and consider how much space you have to devote to your trains. Talk with experienced modelers like us. No matter what you choose, prepare to have a blast! G Scale : G scale is the largest garden hobby scale and is generally used in gardens, It is 1:22.5. which means the real train will be 22.5 times larger than the G sacle model. O Scale: O scale is 1:48 scale. Which means the real train will be 48 times larger than the o scale model. The oldest O-scale trains run on three rail tracks. HO/OO Scale Shares common track :The Most Popular Scales in Model Railroading are Ho and OO. They Share the same track. Only the difference is in there height that is approx. 1.5mm thats not visible by eyes. Conclusion: You can start with any scale Ho or Oo atfer that you can add locos or rolling stock of any scale to them. So not to worry go ahead with this Great Hobby. HO scale is 1:87. Which means the real train will be 48 times larger than the Ho scale model. It is the most popular scale in the railroad modelling. Note: Ho Scale tracks are same as OO scale. You can run your OO Scale Trains over them only coupler are different. But there are coupler adapter avialable to covert the coupler to Uk type. OO Scale is 1:76.2 Which Means the real train will be 76 times larger than the OO scale. It is the most popular scale in Europe. Note: OO scale Tracks are same as Ho Scale. You can run your Ho Scale Trains over them only coupler are different. But there are coupler adapter avialable to covert the coupler to USA type. N Scale :N scale is 1:160 . which means the real train will be 160 times larger than the N scale model. Z scale is 1:220 scale. Which means the real train will be 220 times larger than the Z scale models. Digital Command Control (DCC) is a standard for a system to operate model railways digitally. When equipped with Digital Command Control, locomotives on the same electrical section of track can be independently controlled. The DCC protocol is defined by the Digital Command Control Working group of the National Model Railroad Association (NMRA). The NMRA has trademarked the term DCC, so while the term Digital Command Control is sometimes used to describe any digital model railway control system, strictly speaking it refers to NMRA DCC. A DCC command station, in combination with its booster, modulates the voltage on the track to encode digital messages while providing electric power. The voltage to the track is a bipolar DC signal. This results in a form of alternating current, but the DCC signal does not follow a sine wave. Instead, the command station quickly switches the direction of the DC voltage, resulting in a modulated pulse wave. 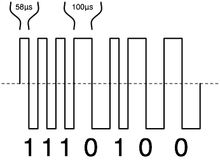 The length of time the voltage is applied in each direction provides the method for encoding data. To represent a binary one, the time is short (nominally 58µs for a half cycle), while a zero is represented by a longer period (nominally at least 100µs for a half cycle). Each locomotive is equipped with a mobile DCC decoder that takes the signals from the track and, after rectification, routes power to the motor as requested. Each decoder is given a unique running number, and will ignore all commands intended for a different decoder, thus providing independent control of locomotives anywhere on the layout, without special wiring requirements. Power can also be routed to lights, smoke generators, and sound generators. These extra functions can be operated remotely from the DCC controller. Stationary decoders can also receive commands from the controller in a similar way to allow control of turnouts, uncouplers, other operating accessories (such as station announcements) and lights. 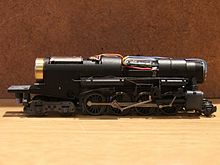 In a segment of DCC-powered track, it is possible to power a single analog model locomotive by itself (or in addition to) the DCC equipped engines, depending on the choice of commercially available base systems. The technique is known as zero stretching. Either the high or the low pulse of the zero bits can be extended to make the average voltage (and thus the current) either forward or reverse. However, because the raw power contains a heavy AC component, DC motors heat up much more quickly than they would on DC power, and some motor types (particularly coreless electric motors) can be damaged by a DCC signal. The DCC system was originally developed by Lenz Elektronik GmbH of Germany in the 1980s for two German model railway manufacturers,Märklin and Arnold (models). The first DCC digital decoders that Lenz produced appeared on the market early 1989 for Arnold (N) and mid 1990 for Märklin (Z, H0 and 1; Digital=). Märklin and Arnold exited the agreement over patent issues, but Lenz has continued to develop the system. In 1992 Stan Ames, who later chaired the NMRA/DCC Working Group, investigated the Märklin/Lenz system as possible candidate for the NMRA/DCC standards. When the NMRA Command Control committee requested submissions from manufacturers for its proposed command control standard in the 1990s, Märklin and Keller Engineering submitted their systems for evaluation. The committee was impressed by the Märklin/Lenz system and had settled on digital early in the process. The NMRA eventually licensed the protocol from Lenz and extended it. The system was later named DCC. The proposed standard was published in the October 1993 issue of Model Railroadermagazine prior to its adoption. The DCC protocol is the subject of two standards published by the NMRA: S-9.1 specifies the electrical standard, and S-9.2 specifies thecommunications standard. Several recommended practices documents are also available. The DCC protocol defines signal levels and timings on the track. DCC does not specify the protocol used between the DCC command station and other components such as additional throttles. A variety of proprietary standards exist, and in general, command stations from one vendor are not compatible with throttles from another vendor. The great advantage of using DCC over traditional DC systems is the simpler wiring needed to operate more than one locomotive at a time. Before, to operate more than one locomotive independently, the track had to be wired into separate "blocks" with switches selecting which controller powered which block of track. If an operator failed to switch control of a block before his locomotive entered, a short circuit or loss of control was possible. With DCC, many layouts can be wired as a single large block, and each operator can control his locomotive without worrying about crossing a block boundary. DCC controllers can include an "inertia" simulation, where the locomotive will gradually increase or decrease speeds in a realistic manner without continuous inputs from the operator. Mobile decoders are available which will adjust the power to try to maintain a constant speed, again without burdening the operator. Most DCC controllers allow an operator to set the speed of one locomotive and then quickly select another locomotive to control its speed. Recent developments include on-board sound modules for locomotives as small as N scale. Wiring requirements are generally reduced compared to a conventional DC powered layout. With DCC control of accessories, the wiring is distributed to accessory decoders rather than all being connected to a central control panel. For portable layouts this can greatly reduce the number of inter-board connections- only the DCC signal and any accessory power supplies must cross baseboard joins. In 2006 Lenz, together with Kühn, Zimo and Tams, started development of an extension to the DCC protocol to allow a feedback channel from decoders to the command station. This feedback channel can typically be used to signal which train occupies a certain section, but as well to inform the command station of the actual speed of an engine. This feedback channel is known under the name Railcom, and was standardized in 2007 as NMRA RP 9.3.1. Piko 55209 H0 Nickel Silver Flexible track 940 mm 5 Pc.